Winter has arrived… bringing the cold, damp weather - whilst it’s nice to think of sitting by a cosy fire with a mug of hot chocolate and some fluffy socks, there’s a more sinister side to winter which needs to be addressed, especially for those who continue to work outside from November through to February/March. Being prepared in advance of the cold winter months is vital, especially as illnesses often occur in the acclimatisation period (it takes 10 days for your body to adjust to new weather conditions). But it’s often hard to find a safety glove that allows you to continue your job effectively, yet keeps your hands protected from the adverse weather conditions. We’ll take you through the consequences of heading out into the cold with inadequate thermal protection, and how to be better prepared and make intelligent choices. Chilblains are small, very itchy swellings on the skin. They most often affect your extremities, such as your fingers, and are caused by bad circulation in the skin due to exposure to cold, damp conditions. In the unfortunate case of chilblains: rewarm the skin slowly, without applying direct heat or rubbing the skin. Apply a corticosteroid cream to ease the itching and clean skin with an antiseptic to reduce the risk of infection. Don’t scratch the affected area as this could leave scarring! Frostnip is a mild condition where the outer layers of skin tissue freeze. This can be reversed, but you should take caution not to rewarm your hands too quickly. Frostbite, however, is more serious and can’t be reversed. The layers of skin and deeper tissue freeze, damaging the capillary walls and making the cells in the affected area sensitive and inflamed. Treating frostbite will need to be carried out by a doctor and may include rewarming, protecting the injury from infection and removing the damaged tissue. Workers should be aware that if they touch really cold metal with bare hands, frostbite can occur instantly, highlighting the importance of wearing sufficient hand protection. Remaining exposed to cold temperatures for prolonged periods of time could lead to the extremely dangerous condition - Hypothermia. This happens when you have an abnormally low body temperature below 35°C (your normal body temperature is 36.5–37.5 °C). The symptoms will begin with shivering and progress to confusion, slurred speech and a slowing heart and respiratory rate. Gently move the person out of the cold to a warm, dry location. Remove any wet clothing and cover in blankets, leaving only the face exposed. Monitor breathing and supply them with warm beverages if they’re conscious and able to swallow. Once transported to hospital, the doctors will decide what medical treatment is necessary. 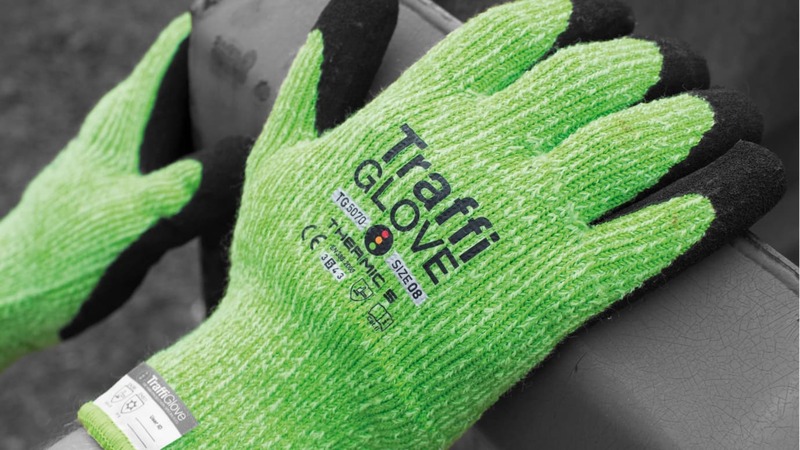 Analysing the nature of the task in hand will help you to select the right safety glove - here’s a few aspects you need to consider for working outside during the winter months. When working in cold environments, body heat needs to be retained. This should be done through additional warm layers of clothing, such as safety gloves, and increasing activity levels for boosting blood circulation. Your fingertips are one of the first places to lose heat, so make sure they’re well insulated. Poor quality safety gloves will compromise on insulation/protection on the fingertips. Despite needing a thermal glove for winter months, there should be no less emphasis on getting a glove suitable for the task. If workers don’t have enough dexterity to carry out their tasks, they may be forced to remove their gloves, leaving them totally unprotected to the weather and other risks involved. Workers could also have to strain their hands to get the job done when wearing safety gloves with inadequate grip, leading to further injuries. Make sure each worker has a well fitted pair of gloves. If they’re too tight it will stop the blood flowing freely round the hand. In contrast, if they’re too loose it will let cold drafts and debris in. Download this Hand Sizing Chart to help determine the right size glove for each individual. When exposed to cold water temperatures, workers face an even greater danger as body heat can be lost up to 25 times faster. It sounds simple but if you’re working with wet components, make sure you’re wearing a safety glove with a waterproof coating. If you’re immersing your hands fully in water, wear a fully coated waterproof glove with a thermal liner for extra thermal protection.